Tariff ~ Standard Room £42.50 p.p. to £62.50 p.p. The Royal Oak Hotel is a picturesque building, which was once a coaching inn. Our luxurious rooms are in keeping with the victorian arcitecture but with a contemporary feel. Situated in the centre of the village amidst charming scenery and overlooking the River Llugwy. 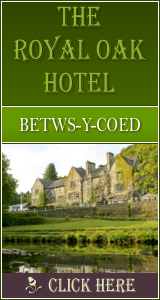 Visitors from all parts of the world are attracted to Betws-y-Coed, which is a convenient centre from which all of Snowdonia and North Wales is accessible. The traditional period design is coupled with a contemporary feel, to provide luxurious comfort whilst maintaining the character of the Royal Oak’s Victorian heritage. All 27 en-suite rooms are well equipped with modern facilities including broadband access. For those special occasions choose to stay in one of our Deluxe 4 poster, feature bed rooms or request a jacuzzi whirlpool bath. All superior and deluxe rooms have LCD flat screen TV’s and all rooms have access to selected SKY channels. For that extra touch of luxury, Spa toiletries are supplied by world renowned manufacturers Gilchrist and Soames. 1797 Click Throughs => �898.5 Since 13/May/2013 based on an example �0.50 cost of a click through from Google pay per click.